Unlike last month, when the tenth highest score was less then one fifth of the highest score of the month... March saw a much more reasonable disparity! 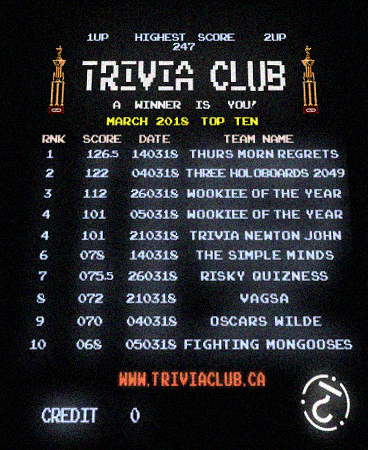 Not only did we welcome our fourth regular location in The Ace, bringing two more twice monthly events to Wednesday and a trivia night back to our original 'hood of Roncesvalles, but when it had all shaken out, the lowest score in the March 2018 Top Ten was more then half of the highest score! The High Score of March 2018 belongs to a team competing at The Ace! We were very proud of our debut at The Ace and our return to Roncesvalles for the first time since The Last Rights & Wrongs at Cardinal Rule! One of the last ten Golden VHS Champs at Our Original Home, or at least part of that team Chillasaurus, were the first Champs at The Ace as Thursday Morning's Regret! This means the team holding the early mark for location high score with 126.5 points, as well as holding the month's highest score. The highest score at The Rec Room for March happened on our Oscar night of Red Carpet Trivia Club on a SUNDAY of all nights, with Saturday Night Live Fantasy League alumni Matt, Rob, Sarah, and friends notching 122 points as Three Holo-boards Outside Ebbing, Missouri 2049! The two highest score at Hitch for March went to Wookiee of the Year, with the top spot and third overall for the month being the 112 points on the 26th of March, three weeks after the month's fourth highest score and giving the bar team at our legacy location, bookends for the month! The fifth highest score of the month, is also the highest score for Farside in March of 2018, with Trivia Newton John (the eleventh highest score of January 2018, and not the tenth highest score O'Trivia Newton John) returning to win the Golden VHS on their second try on March 21st! The sixth highest score of the month goes to the highest score of the month for a team that did not win on the night... with The Simple Minds losing the debut night of trivia at The Ace, but returning two weeks later to post a lower score but walk away with the Golden VHS to make up for it! The entire Top Ten for March 2018 is in fact up of the winners and runners-up of specific nights. Teams competing at Hitch appear the most on this month's Top Ten with four appearances, while The Rec Room, Farside, and The Ace all see two teams each making an appearance. This is the third straight Top Ten appearance for the Fighting Mongooses, making them the only team to have appeared in each 2018 High Score Board so far. The eleventh highest score of March 2018 belongs to Mouse Head, the other part of Chillasaurus who competed at our debut at The Ace, who finished with 63 points, which was good enough for third on the night. The next four high score in March belong to teams competing at The Rec Room! The Mean Team for March, with the high score closest to the scoreboard average, is... a TIE between Wookiee of the Year and Trivia Newton John!